New website’s bold look and enhanced navigation allows customers and prospects to easily explore how Engent can help keep pace with changing market demands and accelerate their product development life cycle. 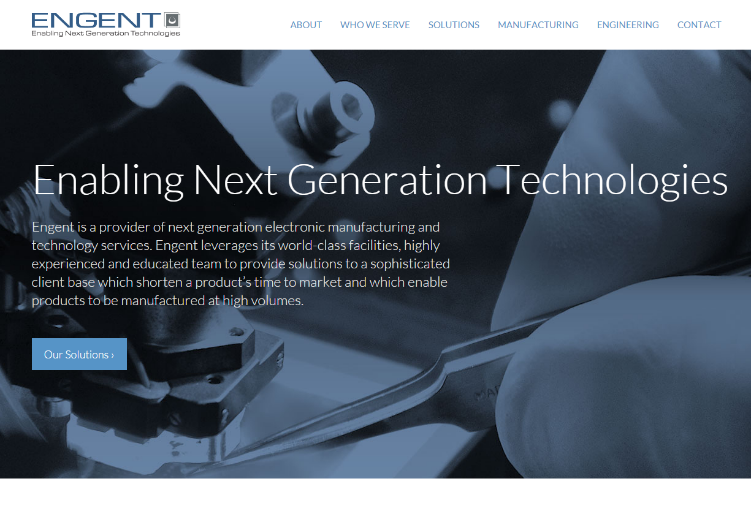 NORCROSS, Ga., March 16, 2015 – Engent, a leading provider of next-generation microelectronics development, testing and manufacturing services, is pleased to announce the launch of its new website, engentaat.com. The site is designed to showcase Engent’s unique capabilities as a company at the forefront of today’s electronics industry. The website’s bold look and enhanced navigation allows customers and prospects to easily explore how Engent can help them keep pace with changing market demands and accelerate their product development life cycle. “The constant demand for smaller, lighter and more functional and durable electronics continues to challenge the industry,” said Matt Perry, vice president of sales and one of Engent’s founders. Founded in 2003, Engent provides product development and full-scale production to a variety of customers. Engent serves the military, medical and industrial sectors, as well as other microelectronic markets. Engent also provides innovation in miniaturization and process development to the consumer electronics divisions of Fortune 50 companies. Its team of experts consults with a global network at all stages, from ideation to product supply to deployment. “If your product roadmap is telling you it’s time to press forward, but your manufacturer is telling you ‘no’, we’ll do everything we can to complete your assembly so you can quickly move your device from concept to consumer,” said Perry.